With Breeze, all of your balances and fares are stored in one place — making it easier than ever to check your balance, reload your card and place an order for new ones. You can't board MARTA if you don't have the right fare. Keeping an eye on your balance is important, and you have three ways of making sure your fares are up to speed with Breeze. Checking your balance online is your quickest option. Once you've setup an account on breezecard.com, head over to your Breeze Balance page. Every fare loaded onto your card — along with any extra cards you've purchased — will appear on that page. Any changes you want to make from there are only a couple clicks away. You can also monitor your balance by phone if you're not able to check online. Have your card ready and call 404-848-5000 to reach our automated answering service. Every Breeze Vending Machine and MARTA RideStore gives you the option of checking the balance on your current Breeze Card. If you're in a station and need to double check your balance, insert your card into one of the machines and follow the prompts on screen. Breeze Cards are meant to be used again and again. Unlike tickets, these plastic cards are designed for you to reuse and reload as often as you need. You have two options for reloading your Breeze Card. Breeze Vending Machines and MARTA RideStores both offer ways to reload your card. The process is similar to purchasing a new card except, in this case, you'll simply select the on-screen option to add new fares and passes to your existing card. the types of fare you need. 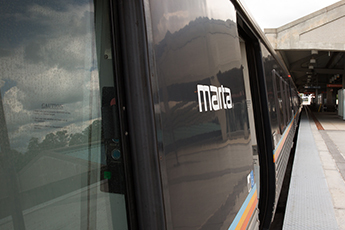 All of your fares are associated with your account and will be available the next time you tap your card at a MARTA station. Don't worry if your purchases are still considered "New Products." Any fares purchased online will remain under New Products until they're loaded onto your card the next time you ride MARTA. Note: We accept Visa, MasterCard and Discover for online purchases. You'll need to visit one of our stations if you plan on using any other type of payment. Stored value refers to the dollar amount loaded on a Breeze Card that may be used to purchase fare. To load stored value onto a Breeze Card, you may use cash or a credit/debit card at a Breeze Vending Machine at a MARTA station or MARTA RideStore. Whether you're buying additional Breeze Cards or replacing an old one, ordering cards online is a great option. All you need to do is log into your account (or register a new one) and choose the option to buy a new card. You'll also have the option to select the types of fare you want to preload onto the card. Once you've made your purchase, you can expect delivery to take one business week. Because of delivery times, buying online is best for people who don't need to use their cards immediately. If you don't have time to wait for new cards to arrive, your best bet is to go with one of our in-person options.